Soul is “that unknown component which makes meaning possible …” James Hillman, Re-visioning Psychology. With the Sun in Scorpio it is time to attend to our souls. This is the season of death when the veil between the world of the living and the world of the dead thins to the point that we are able to merge those worlds for a time. We have the opportunity to restore ourselves to wholeness when we commune with the dead. This is a crucial time of exchange and rebalancing of the forces of death and life. This restoration is the work of soul, the mysterious component Hillman speaks of above. This essence of self, the soul, needs this deepening process. Missing a connection to soul, our lives become dry, brittle, and inconsequential. It is time to get juicy again! It is time to restore soul. Although it sounds terribly mysterious, this communing with the dead, it isn’t. This work is about remembering our beloveds who have passed on, honoring the fields and animals who through giving their lives made ours possible, and it is about acknowledging that each of us will pass on too—our lives will also become the flesh and fields that feed those who come after us. Why does death restore soul? Imagine a world without death. Fantasy authors have written stories about this very idea. The outcome is usually horrific. We need death for life to be renewed. Death gives us relevance, longing, and intensity. It provides darkness when too much light is exhausting. Knowing that we are more than creatures of light and life, knowing we are mortal, knowing that we are part of a larger pattern than our brief lifespans would indicate, all these things develops soul. Soul is mystery. It is the unknown component that gives meaning. This week, there will be a Full Moon is in Taurus (the opposite sign to Scorpio). Taurus is the springtime energy of life renewing. The Moon is illuminated by the Scorpio Sun, revealing how death feeds life. In the Spring, the Full Moon in Scorpio, which happens when the Sun is in Taurus, mirrors the opposite principle: life feeding death. Feel this pulsation. Honor this cycle. Just a few days after the Full Moon, Pagans celebrate Samhain or Halloween while others celebrate the Day of the Dead. This is the week of the thinnest veils. As the worlds merge, seek to honor and listen to the wisdom of death. Notice the effect on your soul. Sunday, October 28. The last day of the Gibbous phase of this lunar cycle zips along as the pressure of the impending Full Moon builds. Last week, a huge emphasis on water signs lent a somewhat dreamy tone to the week. Not much about today reminds us of that energy. The Moon is in Cardinal Fire sign Aries and the ruler of Aries, Mars, is opposite expansive Jupiter too. This energy is impulsive. We have shorter fuses. This can create misunderstanding or impatience, but it can also be the impetus to make a necessary change. There is a quality of restlessness and a strong desire to understand or make yourself understood today. Mercury, the ruler of communication, enters Sagittarius bringing our conversations to the far reaches of the world. How will you expand your horizons? Will it involve listening to a point of view different from yours? What if listening alone could help us be more peaceful? The idea of peace floats around the edges of all this impulsive energy as Venus, the planet of harmony, moves into Libra today. Venus’s influence is strong in this sign. We have an opportunity to reconnect meaningfully with our intentions set at the New Moon in Libra on October 15. * This month I am seeking the liberation of the balanced scales, claiming the freedom to make choices based on the balance I create in my life. Venus supports balance, exchange, and collaboration. This planet helps us see and value the opposite side. 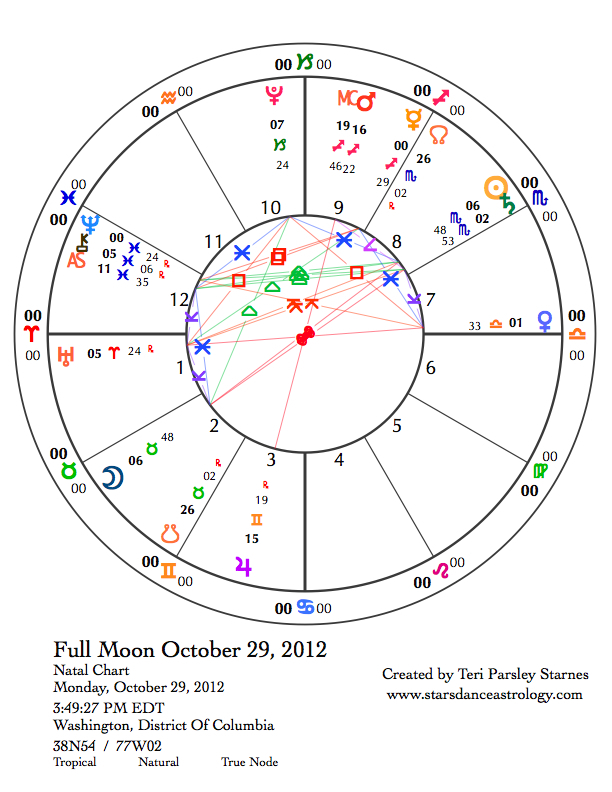 October 29—Full Moon: Illuminating. To find balance, we include the opposing force. Every sign of the zodiac is seeking the opposite sign for completion. This phase of the Moon is illuminating, not just because the Moon is brightest now. This phase is illuminating because the signs opposite each other, inhabited by the Sun and the Moon, have a chance to realize some piece of understanding that is only possible when they integrate. 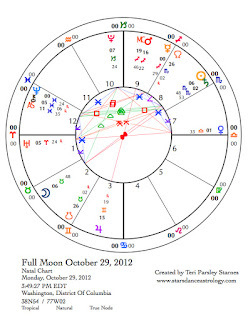 There are several oppositions in the Full Moon chart. This tells me there is a lot of potential for illumination right now. The core symbolism of this Full Moon is the relationship between death and rebirth. There are other ways this pair of opposites can manifest, such as through release and attachment, decay and growth, or transformation and stabilization. For balance, we need to understand the ways these forces work in our lives. Saturn joins the Sun to add emphasis to the importance of this opposition. Mars in Sagittarius opposite Jupiter in Gemini brings illumination to how we understand and communicate truth in big and small ways. Every one of us has a small piece of the puzzle. We can feel isolated and insignificant until we realize that each of us is crucial to the big picture. We are greater than the sum of our parts. We get an illuminating vision of that truth right now. Venus in Libra opposes Uranus in Aries. Uranus is the planet of awakening. In Aries, Uranus seeks to awaken the authentic self. It says, “Be true to yourself. Follow your destiny. Don’t wait for anyone.” Alone, this courage and daring can become belligerent and foolhardy. The opposite forces of relationship and collaboration help us to balance action with consideration. The square between Mercury and Neptune indicates that we may not have as much clarity as we think we need. Some details are fuzzy. It becomes hard to get a handle on what we want to say. In just a few days, Mercury will turn retrograde, signaling a time to use the intuitive side of our brains more. Begin that practice now. This aspect may not be great for rational mind, but it helps the work of communing with the dead. Be receptive. Tuesday, October 30. The Moon is Void-of-Course the whole day today and into the morning tomorrow. This means, the Moon has no more important aspects to make with other planets until it leaves the sign of Taurus on Wednesday. The last aspect the Moon made before going into this void period was a trine to Pluto. This aspect colors the day. Pluto co-rules Scorpio. Even if the day feels a little off course, it is possible to do some deep powerful soul work. As you go about your day, take random, small moments to honor the transformative power of death. Thursday, November 1. Venus is not a pushover. Just because there is a desire to create harmony, doesn’t mean the Goddess of Love and Beauty won’t also take risks, go to the edge, in order to balance the accounts. That kind of dedication is abundant today. Stick to the desire to find liberation through balance. November 2—Disseminating Moon: Sharing. Election Day is five days away. What message about these important decisions do you want to share with others? Effective communication, on all levels, is easier with clear intention and a calm mind. Those things may be hard to find as the last aspect the Moon makes before going Void-of Course for the day is an opposition with Mars. What has given you a sense of balance this lunar cycle? Use that knowledge to live a life of beauty and meaning. Share that joy with others. Saturday, November 3. Attention turns to security. Notice feelings of fear and reactivity, and see if you can replace them with a centered sense of connection with home and hearth— what and who matter most to you. The hearth can be our homes, our families of blood or choice, communities that we value, and special places that feed our spirits and bodies. The hearth is a resource today if you are feeling off-center or afraid. Honor that healing power. The Sun enters Scorpio this week. We have the opportunity to join in this dance of death—a beautiful dance that actually affirms life. I love this season of paradox and wistfulness. The contradictions make everything more real, which is Scorpio’s ultimate goal. Scorpio rejects the pleasing façade, anything that wants to put a pretty face on what is really going on under the surface. When we dare to look beyond that face, fears and shadows arise to deter us. However, when we surrender to the dark, we see the seeds of life waiting there. This is the potency of the depths. How can we not be excited about that? The Scorpio season is magnetic. There may be a pull to forget the intentions we set at the Libra New Moon. * But we can use this force to give our Libra visions a dose of gritty reality. I am working with liberation this cycle. This is the freedom of being in balance. One key to balance is an enhanced sense of self-awareness. If we move past fears we acquire the power of seeing ourselves more clearly. In this work, I notice deflection, defensive shielding, escapism, and shame. But I also need to notice strength, openness, worthiness, and courage. The scales ask us for balance. We have to see and accept everything. October 21—First Quarter Moon: Manifesting. If you are like me, you’ve got the skill of self-criticism mastered. So, what do you really need to do to manifest your heart’s desire? Perhaps the balance to self-criticism is a good, solid practice of self-acceptance. Today, with the Moon in goal-oriented Capricorn, we can commit to doing what it takes to bring about what we long for, even loving ourselves fearlessly. Mercury, the ally of thought, and Venus, the ally of beauty, have been working together this last week to bring about a useful merging of these two qualities. The Moon is helping too. Let’s use this energy to open to creativity, insight, and pleasure. Secretly these are the resources of manifesting our New Moon intentions. The challenge may be to take our creativity and enjoyment seriously enough. There’s another influence to notice today. The next New Moon on November 13 will be a Solar Eclipse at 21 degrees Scorpio. Today, Mercury reaches that triggering degree of Scorpio. Eclipses heighten our experiences, making them more dramatic and more significant. This is an invitation to follow Mercury’s lead into new terrain. Open with inspiration. The source of insight may come from the depths, from the dead, from the places of transformation. Monday, October 22. The Sun enters Scorpio today, while the Moon looks on from Aquarius. Both of these signs are Fixed and have strong opinions about how to do things. Scorpio prefers the hidden places; Aquarius wants everything out in the open. We might feel uncomfortable when our own secrets are revealed but pleased when the toxic secrets of others see the light of day. Will you accept exposure so that truth can be revealed? This tension between Water and Air may be felt strongly. Feelings and ideas could battle each other, but what if we welcomed both of these pieces of ourselves? Tuesday, October 23. The dance between Water and Air continues today. When these forces combine, our ideals are strengthened by expansive feelings. Pay attention to your heart as you go about your business. Take time for solitude, meditation, or art. Your soul is trying to tell you something. Wednesday, October 24. And suddenly Water is everywhere. 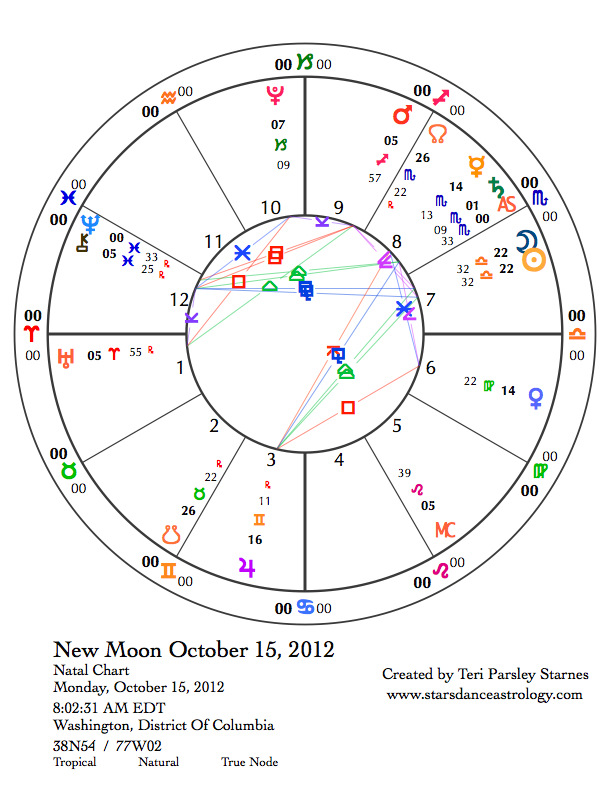 The Moon enters Pisces, conjoins with Neptune, trines the Sun and Saturn, and sextiles Pluto today. Let yourself go with the flow. To get in touch with your feelings, what do you need? Solitude or close companionship? Watery states of being are more reactive, have a greater need for safety, and sometimes blur boundaries, however when we risk intimacy, truly caring about others, we heal from the heart out. Let this healing help you find the freedom of balance. October 25—Gibbous Moon: Perfecting. The Moon has waxed into its Gibbous phase. I always see a pregnant belly when I look at the Moon at this time. Something is getting ready to be born. What longing fills you to bursting? If it is the freedom of the balanced scales, what do you need to do to make that longing a reality? Feelings have been washing over us the last few days and continues today. Memories may surface that you are ready to acknowledge and compost. The Sun conjoins Saturn for the first time since Saturn entered Scorpio. We may get information about what our Saturn work will be for the next two and a half years. Saturn is the Great Teacher. His lessons are both difficult and worthwhile. What is the teacher asking of you? The delicious connection between Mercury and Venus perfects today. Here are some keywords to inspire your communion with these allies: beautiful, pragmatic, soul-knowing. Add that to your recipe. Friday, October 26. Today, Mercury reaches its greatest elongation from the Sun as the Evening Star. This means that Mercury is the highest it gets in the west at sunset and so is the easiest to see. If you have a clear western horizon at sunset, look for Mercury. Go to EarthSky to find out how to locate Mercury. We can commune with the planets. Viewing them with the naked eye is a powerful way to develop your own relationship. There is another significance to this stage of Mercury’s cycle. After greatest elongation in the evening sky, Mercury rapidly sinks closer to the Sun getting ready to turn retrograde (on Election Day). The retrograde portion of Mercury’s cycle is perhaps the most mystical segment. We turn off the rational and open to the intuitive. Synchronicities are telling us something. It is time to pay attention. Mercury, also known as Hermes in Greek myth, plays the role of the psychopomp, guide of souls, while it is in Scorpio. Right now, I am wondering what our ancestors want to tell us about the U.S. election. There is a great probability that the results of the election will be impacted in some unexpected way due to this retrograde of Mercury. If you are inclined to do magic or visualization about this election, how would you use this information? Saturday, October 27. Very early this morning** the Moon in Aries contacts Uranus and Pluto. We’ve been communing with Air and Water for most of the week. Fire bursts on the scene today. Move your body to release excess energy. Let your passions guide you to the action you need to take. You might want to use this energy to learn something new, take a class, read a fascinating book, or have a transformative conversation. Energy builds in the Gibbous phase of the Moon. Sometimes we need to know when to focus that energy and when to release it. This awareness feeds our sense of balance, creating the freedom to make conscious choices. Do not feel bad if all this Fire isn’t energizing for you, some of us will feel the Water trine between the Sun and Chiron more strongly. Listen to your heart if you are feeling vulnerable. Congratulations, Libra! You have successfully navigated the demands of Saturn transiting through your sign. Certainly, you have been tested. You might even have felt like giving up, but here you are on the other side able to reap the satisfaction of good work and solid accomplishment. Saturn has moved into Scorpio and Libra gets to gloat a little. It’s my belief that all the signs reside in us as archetypes. We may not have a planet in Libra in our charts, but every chart shows Libra somewhere and every one of us has been asked to improve that little bit of ourselves over the last 2 ½ years during Saturn’s transit. So, give yourself a pat on the back and shine up those newly-acquired Libran skills. Let them sparkle this lunar cycle. The New Moon in Libra on October 15 is a wonderful opportunity to honor them. The usual Libra run down of qualities includes harmony, grace, balance, even justice. Of course, we’ve been applying ourselves to improving partnership skills as well, but the Libran quality I want to honor after this Saturn work is freedom—the freedom of knowing how much is needed and how much is too much. This is the freedom of the scales. The Libra scales have two plates suspended from a single point between. When the plates are empty the scale swings freely, when something is placed on just one of the plates, the other side rises up and locks in place. There is no movement until balance is restored by adding an equal weight to the empty plate. When Libra is working well at supplying balance, we experience harmonic freedom. We’re flexible. We are in alignment. There’s a chance to clear the balance sheets. We’ve paid what we owe and we’ve been paid what we’re due. Freedom. The U.S. election happens this lunar cycle—another reason I plan to work with freedom. I want to invoke it for myself and visualize it for the world. Rather than face the debt we owe as a nation with dread and despair, I want to get excited about the freedom that comes from living in balance. We deserve this freedom; Saturn says so. Sunday, October 14. Even though the New Moon isn’t until tomorrow, we are in the Libra dream during this dark Moon time. Let yourself dream of freedom, of the opportunity to balance the scales. There is a bit of agitation this morning as the Moon triggers the square between Uranus and Pluto, which impels us to take action. Mars in Sagittarius squares Chiron in Pisces. Are you being tested right now? Wounded feelings can bring out defensiveness or a desire to get away from it all. Noticing these patterns helps us attain wisdom. October 15—New Moon: Dreaming. Liberation is another word for freedom. This month, how about we liberate our essential goodness? It’s been imprisoned by despair. Is this an alluring invitation to you too? I invite you to use this New Moon to liberate your essential goodness. How will you affirm your amazing contributions? 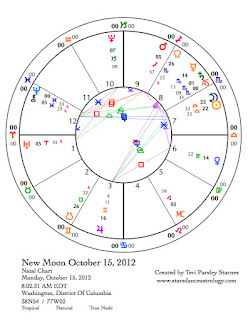 The New Moon chart shows our allies in the quest for liberation. It is time to dare something new in the service of transformation. The ongoing square between Uranus and Pluto has been preparing us to let go of the rigid past. We see fewer and fewer reasons to cling to old ways of doing things. Even as we honor our ancestors, even as we honor our traditions, we are seeking to have a fresh outlook. Mars in far-ranging Sagittarius wants us to focus on the growing edge. How far will we go to learn a new way of thinking? This expansive energy squares Chiron—a wound motivates us. The feeling of collective pain and despair provokes action. Saturn, now in Scorpio, trines Neptune. The planetary ally of reality encourages the planetary ally of faith. In Scorpio, Saturn says don’t buy into illusions; be real. Neptune uses this dose of reality so we may align our hearts with substantive action. We can go big, with our critical functions intact. An influx of compassion feeds our liberation. Jupiter in Gemini has recently stationed retrograde. It will travel back and forth over the first half of Gemini until the end of April. The gift of Gemini is the ability to make endless connections, follow countless paths of information to contribute to our body of knowledge. The challenge is one of focus. Too much stimulation takes us off course. The act of balance here is to notice and respond in ways that bring us to the center. At the New Moon, Jupiter squares Venus in pragmatic Virgo. This tension encourages us to establish practices that help us with our focus. Mercury plays a role here as well. Mercury has a special affinity to both Gemini and Virgo. So, it wants to influence the possibilities of new discoveries as well as establishing our systems that sustain us. Since Mercury is now in Scorpio, the help comes from depth. We should not overlook what resides deeply within. We tie these loose ends together when we respect ourselves. Choose an ally for your work of liberation. A chart is a complexly woven web. Working with any of these pieces eventually leads us to all of them. Tuesday, October 16. The aspects between Mercury, Venus, and Jupiter are exact today. The way may be challenging, but there are very interesting possibilities hidden at the root. The tension is between a scattered and a focused approach. The call is to honor our whole selves, every single piece, leave nothing out. This includes embracing our imperfections, our mistakes, the times we’ve lost our way, the times we’ve been afraid. Liberating our essential goodness requires us to see all of this and to love it. Wednesday, October 17. It might seem like nothing much is happening today, but it would be a big mistake to undervalue what goes on under the surface. The Moon is in Scorpio today and void-of-course until this evening. Get used to looking at the old roots of attitudes and behaviors. We’ll be following these trails for a while. The great news it that getting to the source releases power that can liberate us from fear. The New Moon phase ends tonight with the Moon entering far-reaching, far-seeing Sagittarius. Have you set your intention for this lunar cycle? October 18—Crescent Moon: Beginning. An intention creates a longing. That longing takes us on a journey. Now we begin to see that journey unfolding. As the Moon is in Sagittarius, we embark on a journey that will change us. From strange lands a new philosophy arrives. Be open to releasing old beliefs. Open up the path for each of us to do the greatest good while having the most fun. Let’s have fun as we work to transform this world through the experiment of democracy. Since Mercury will be in Scorpio, we can include a visualization that secrets be uncovered. May those who wish to hide, be exposed for all to see. Let us claim the power that comes from secrets revealed. Friday, October 19. Following a path of integrity feels good today. The Moon in Capricorn encourages us to be true to our values, our words, and to claim responsibility for our intentions. Be ambitious for liberation. We are able to commit to the long haul and feel good about it. Saturday, October 20. Yesterday’s good feelings may shift today due to challenges. This always happens. The cosmos seems to love testing us when we claim our desires. That’s OK. Perhaps the testing is really a way to show love for what we humans can do as we practice intention-based mindfulness. We often underestimate what we have accomplished and what we can accomplish. Take any challenges today as an affirmation. * All times are CDT. We are only halfway through the Sun’s transit through Libra but an emphasis this week on Scorpio draws attention to the world below us. The veil is thinning. The season of Scorpio is about death. In the northern hemisphere, leaves are falling—the vital energy of plants either goes into the seed or retreats into the root for next year’s growing season. This pull downward is a major component of Scorpio energy. The thinning veil is the separation between the living world, above ground so to speak, and the world of the dead below. At this time we call on and honor our ancestors. We remember that we have many allies and guides as we journey through life. I want to use the last week of this lunar cycle to seek this wisdom and honor this connection to my beloved dead. Last week Mercury and Saturn entered Scorpio together. (See last week’s forecast for more about this.) Mercury holds our attention through word and thought. Saturn tells us to get more serious about how the underworld of death and transformation completes an important piece of our personal journeys. We could describe this work as soul retrieval. Something is missing, and the way to get it back is to open up that box of fears we’ve been sitting on. We learn that fear is more debilitating than whatever is hidden in that box. We are stronger than we think. A commitment to seeing our shadows with open eyes and hearts will yield incredible power and vitality over the next two and a half years. The last week of a lunar cycle is about evaluation and release. We admit to our failures and our successes. Which is harder for you to acknowledge? The evaluation returns us to the intention of the Virgo New Moon*. Virgo, the sign of the helper, the worker, the servant seems so humble yet is so important to our daily lives, giving them structure as well as meaning. When Virgo’s attention to daily practice joins with Scorpio’s commitment to transformation, we have the potential to make significant changes in our lives. Two planetary allies help us with this work over the next few weeks. Until the beginning of November, Venus in Virgo and Mercury in Scorpio are in a close sextile aspect with each other. Venus invites us to experience the beauty of order, practice, and service. Mercury piques our curiosity to see what has been hidden away. This week Venus and Mercury form aspects with Chiron, Uranus, and Pluto. The agendas of these planets contribute to the sense that we are in a significant period right now. Chiron in Pisces—to carry collective pain till it heals. Uranus—to awaken to the actions we must take to be authentic. Pluto—to transform toxic structures of authority and oppression. Mid-week, Saturn in Scorpio trines Neptune in Pisces for the first of three times over the next nine months. These two planets in water signs are in a supportive, harmonious relationship that emphasizes the capabilities of intuition, compassion, surrender, and transformation to create lasting structures. Neptune often leads us into fantastical states of unreality, but it also has the potential to help us heal from grief and despair. With help from Saturn, we may glimpse the grounded side of Neptune. It is time to believe that the work we do can make a difference. We can serve a greater vision. Sunday, October 7. Venus in Virgo opposes Chiron today. There is a pull between the extremes of sacrifice and service. Can a sense of panic be sustained? Will it help in the long run to give our all until we have no more left to give? We get to feel deeply the pains of the world and at the same time honor the small contributions we make to ease that suffering. Mars in Sagittarius in a challenging relationship to Neptune only increases the possibility of impulsive action to save the world. Where does the panic come from? Can it be acknowledged and then let go? Some of us may react to the tension by running away. Even those journeys can lead us back to ourselves. Because the Moon is in Cancer today, the square between Uranus and Pluto is triggered too. Notice what you want to protect with all your heart. That is your home. October 8—Last Quarter Moon: Evaluating. Is your cup half full or half empty? What does it feel like to say that it is both? Nagging paradox rules over the next few days. A Yod aspect configuration of Venus sextile Mercury with both in quincunx aspect to Uranus calls for an adjustment in perception and action. We are itching to go our own ways, perhaps ending relationships, quitting jobs, or moving to a new place. However, there are no simple solutions. The energy is the dissonance between immediate, bold action and quiet, sustainable practice. The excitement is we get to lose faith and recover faith very quickly. What does this prepare us for? In addition, the Sun and Jupiter throw a party about ideas, connections, and inspiration. This breath of hope, amid dissonance, can be shared with those who have made our lives possible–our ancestors. A prayer of gratitude is beautiful gift that benefits the giver. Tuesday, October 9. This is a busy, energetic day. The Moon enters fire sign, Leo. Everyone wants to feel valued. Perhaps you are trying to figure out where you and your gifts fit in and this might lead to a realization that the group you were trying to impress just isn’t the right group for you. Regardless of the audience, our gifts are inherent; we are valuable when we stay true to those gifts. It feels more comfortable to spend time with the people we really value and trust. You might learn something really important from a close relationship. Wednesday, October 10. This is one of those days we are able to reach deeply into our souls and high above into the cosmos. Deep and expansive both. Considering that the Moon is waning into its dark phase, it is a good time to travel the inner pathways to receive vision and make connection with those on the other side of the veil. October 11—Balsamic Moon: Surrendering. The Moon returns to Virgo today, almost completing the circuit of the zodiac that was begun at the New Moon. Rituals of release are powerful. We may benefit from releasing attachment to perfection. For the last few weeks, the song, Anthem, by Leonard Cohen has been giving me a lot of comfort. Honor the work, honor the imperfection, honor the allies and guides who help us along the way. Friday, October 12. It feels good to know we have tried our best. To honor yourself, find time to return to your center. Notice how good it feels to bring a little more order into your life, whether it comes through cleaning your house, organizing your files, or returning to a spiritual practice. Another poem, this time by Rumi, helps me to begin again. Saturday, October 13. Most of the day, the Moon is in Virgo and void-of-course. Consult poems, honor the work, release expectations. The Moon moves into Libra in the evening. ** This is a wonderful night to experience the beauty that creates meaning. We appreciate our partners. Remember also those partners who are no longer living. We are related to them too. * See the forecast for the week of the New Moon September 15 to follow along with the developing energy of this lunar month.